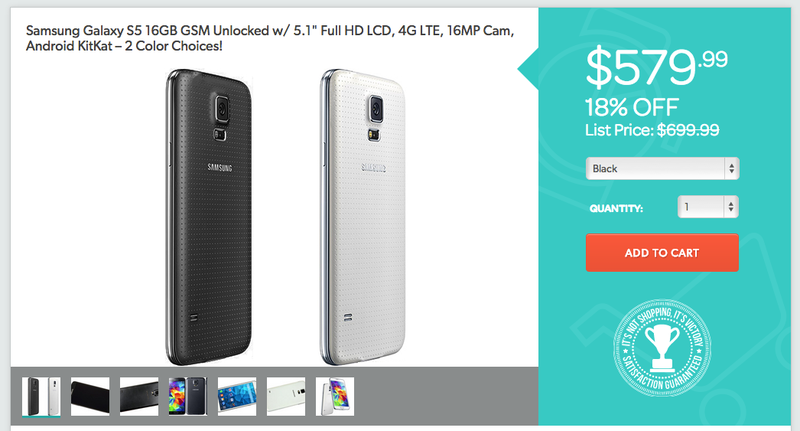 Daily deals site 1Sale, is currently offering folks the chance to purchase Samsung’s newest flagship device, the Galaxy S5, for 18% off the suggested retail price of $699.99. This markdown brings the off-contract total of the phone to $579.99, which is a good deal considering you can purchase the device elsewhere off contract for nearly $700. 1Sale states it is a GSM-unlocked variant, model SM-G900T, meaning if you do purchase, it should work just fine on T-Mobile’s network, 4G LTE included. However, make note, it will not work on any CDMA networks, such as Verizon and Sprint. Please keep that in mind if you do plan on purchasing. In the specs section of the listing, 1Sale lists the compatible bands, but does not include T-Mobile’s, which is rather odd. More than likely a typo, but buyer beware. The condition is new and factory sealed, coming with a full 1-year warranty. If the Galaxy S5 is on your shopping list, and you don’t feel tempted to wait for a possible Galaxy S5 Prime, then go grab it.